The Community Health and Care Village is an urban community hospital, encompassing services previously provided in a number of separate locations throughout the city, brought together in a fully integrated facility. BHC Ltd. worked with main contractor Miller Construction on this project, which was completed in 2013. The innovative 6,500 sq metre health care complex on the city’s Frederick Street features an array of facilities ranging from physiotherapy and dental provision through to minor surgery suites and 29 consulting rooms. 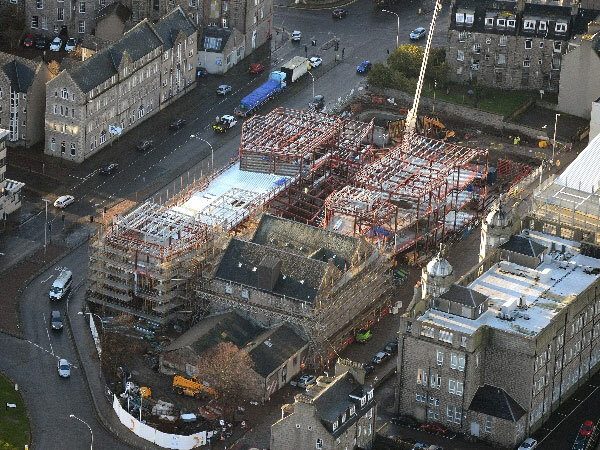 The construction site of the Aberdeen Health and Care Village was surrounded by busy roads, with only a limited amount of space for storing materials. An advantage of using steelwork is that it can be delivered on site in a just-in-time basis and can be unloaded and erected immediately. Delivery loads were limited to a maximum length of 12 m.
For this project, BHC followed an irregular structural grid pattern due to the various sized surgeries, offices and waiting rooms. The structural grid loosely followed a 7.5 m x 10 m pattern in the basement car park and then changed to 7 m x 6 m for the surgeries and offices. A number of transfer structures are located above the car park to accommodate the larger open plan courtyards. Vibration was an important design consideration due to the intended nature of the building, meaning that the framework had to meet the strict vibration standards required for healthcare buildings. The compliance of the steel floor plate was demonstrated using the methodology to calculate vibration response given in SCI’s guide p354. When BHC began erecting the structural steelwork, work on the basement had already commenced therefore BHC had to phase their work around the groundworks. 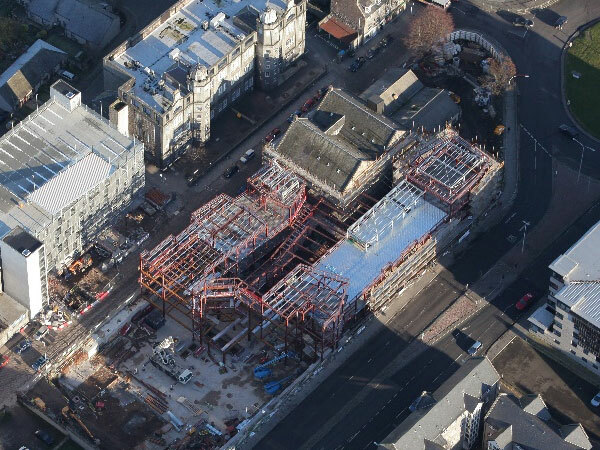 As BHC began erecting the steelwork, the available onsite space decreased, meaning only one mobile crane could be operated onsite. A 25 tonne capacity mobile crane was used early in the steel erecting programme, however, this was upgraded to an 80 tonne crane when a longer reach and capacity was required. BHC were also responsible for the installation of the steel framed lift cores, precast stairs and metal decking.